NEBRASKA: Anti-Gay Lincoln Woman Lives In Home For The Severely Mentally Ill - Joe.My.God. As some of you guessed, the Nebraska woman who issued that bizarre anti-gay rant to the Lincoln City Council is a diagnosed schizophrenic. It wasn’t the first time Svoboda has testified before the council. She also is a registered lobbyist at the Capitol. She usually speaks twice a month during the council’s open mic sessions, where citizens can talk for up to five minutes on any topic. The council sits patiently until she is done. Svoboda has talked about Chinese “subliminals” that come through cellphones and other electronics, paradise on earth and family members being killed by doctors. She once brought in a large stick figure that she said was her mother’s ghost, but the council told her not to bring in props anymore. She’s also well-known on the University of Nebraska-Lincoln campus, where she’s handed out thousands of fliers. Students have dubbed her “Crazy Blue Protesting Lady” because of the blue coat she often wears. A Facebook page about her has nearly 3,000 members. How could such a deeply mentally impaired person be allowed to be a registered lobbyist? That’s easy. It’s because such literally insanely deranged people are often indistinguishable from the rank-and-file religious haters that organize against us. 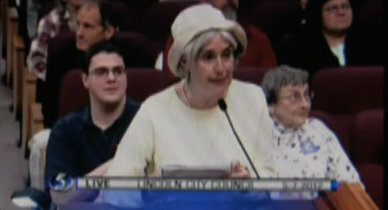 How different are Ms. Svoboda’s delusions from those who believe in a God that sends earthquakes to stop gay marriage?